The development of fast, non-invasive and accurate diagnostics is of great importance in the medical field. Lasers, and optical spectroscopy and imaging techniques provide many new possibilities. Most frequently broad-band spectroscopic techniques are used for studying tissue constituents. 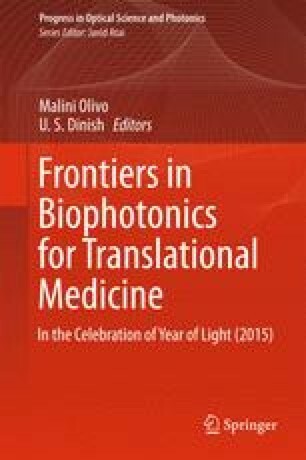 Instead, the development of novel methods for monitoring free gas in situ using narrow-band laser spectroscopic techniques in the diagnostics of common infectious diseases and for the surveillance of pre-term infants is presented in this chapter. The gas in scattering media absorption spectroscopy (GASMAS) technique is used, relying on the fact, that the absorptive imprints of free gases are typically 10,000 times narrower than those due to the tissue itself. The work is in a translational process aiming at better diagnostics of common sinus and middle-ear infections (sinusitis and otitis) and for the management of the respiratory distress syndrome and necrotizing enterocolitis in premature infants. The authors are grateful to a large number of colleagues and graduate students who collaborated in the development of biomedical applications of Gas in scattering media absorption spectroscopy. These persons include Mats Andersson, Stefan Andersson-Engels, L. Cocola, Vineta Fellman, Zuguang Guan, Jing Huang, Kjell Jonson, Emilie Krite Svanberg, Märta Lewander, Tianqi Li, Liang Mei, Sven Lindberg, Patrik Lundin, Linda Persson, Roger Siemund, Gabriel Somesfalean, Tomas Svensson, and Hao Zhang. The work was supported by the Swedish Research Council (VR), through a direct grant and a Linnaeus grant to the Lund Laser Centre, by the Lund University Medical Faculty, the Knut and Alice Wallenberg Foundation, and by the Guangdong Province Innovation Research Team Program (No. 201001D0104799318).